at Wadi Rum in Jordan. Let the fabled T.E. Lawrence come alive, whether through memories stirred from the screen version or from the pages of history and the actual exploits of the legendary British officer. filmed there and it was also the location where T.E. Lawrence himself was based during the Arab Revolt. Wadi Rum transportation A desert police fort is located at the entrance to Wadi Rum, where the police are not mounted on horse or jeep, but on camels-ships of the desert. Today Wadi Rum challenges climbers to scale its sheer granite and sandstone cliffs, to hike along mountain trails and valleys, to trek deep into the enchanting landscape in four-wheel-drive vehicles, or to join two or three day desert safaris on camel-back or 4x4 vehicles. 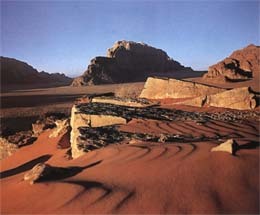 Stunning in its natural beauty, Wadi Rum epitomizes the romance of the desert. 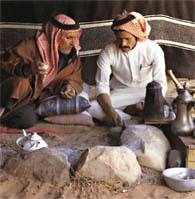 Now the home of several Bedouin tribes, Wadi Rum has been inhabited for generations. 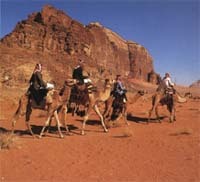 in Wadi Rum, and in scattered nomadic camps throughout the area. You may be invited to share mint tea or cardamom coffee in their black tents, perhaps sitting by the fire under a starry desert sky-it is an experience you will never forget.